The hazelnut, also known as cob, cobnut and filbert, comes from the Hazelnut tree. There are more than 14 species of hazels (Corylus) which are deciduous trees and shrubs native to the temperate regions of the northern Hemisphere. The history of hazel nut consumption goes back 9000 years and the nut was considered sacred by the ancient Chinese. It is cultivated all over Europe, especially Italy, Australia, Asia and the US but three quarters of the world’s production comes from an area near the Black sea bordering Turkey. Depending on the species, hazelnuts are round to oval and covered in a bitter tasting skin inside and smooth shell which is encased in a fibrous husk. Cold pressed Hazelnut Oil is made from lightly roasted hazelnuts and has a slight yellow hue, a nutty aroma and is full of enzymes, B vitamins and trace elements like potassium, magnesium and calcium. It is mostly made up of the monounsaturated Omega-9 oleic acid with linoleic acid (Omega-6)coming second, followed by a touch of palmitic and stearic acids and a smidgen of linolenic (Omega-3) and gadoleic acids. High in vitamin E, polyphenols and the natural flavonoids catechins and tannins, it has squalene and tocopherols too. Besides being moisturising, Hazelnut Oil has cell regeneration and astringent qualities. This is very useful for oily and combination skins and for the acne prone. It balances sebum production whilst encourageing healing through new cell growth. It absorbs well and tones and tightens skin by reducing pore size. Despite being a dry oil, the fatty acids plump skin and help maintain elasticity. Additionally, Hazelnut Oil strengthens capillaries and helps with microcirculation. The antibacterial components protect skin from bacteria and the antioxidants helps quench free radicals, the enemy of youthful skin. It is also a natural sunscreen. Hazelnut Oil is great as a base oil for aromatherapy massage as it absorbs the fragrance from essential oils well. Used in face creams, it is good for toning and moisturising sensitive, oily and combination skins. It works well on its own as an eye make-up remover and a couple of drops added to bath water make a wonderful treat. Hazelnut Oil is used commercially in cosmetics like lipsticks, bath oils, soaps, sunscreens and hair products. Used on colour treated hair, Hazelnut Oil helps preserve the colour for longer by preventing colour oxidation and by protecting hair from UV damage. Hazelnut Oil is a bit of a gourmet cooking oil. It is fairly pricey and has a strong taste and smell but a little goes a long way. It can be moderately heated but seems to be better when added after cooking, as a condiment rather than a major ingredient. It is delicious in salads, pasta, vinaigrettes and on roasted vegetables and can be used as an interesting substitute for olive oil in pesto. Hazelnut oil as a dietary supplement is nutritious, easy on the digestive system and kind to cholesterol levels. The lettuce leaves serve a dual purpose - edible containers and attractive presentation. Finely dice the red capsicum and toss together with diced feta in a bowl. Add the Hazelnut Oil, salt and pepper and stir to combine. Separate the lettuce leaves and arrange side by side on a serving plate. Fill each one with some of the mixture and garnish with the chives. Put the Hazelnut Oil in a tinted bottle and add the essential oils, gently shake to mix. Massage this oil blend into the affected area. Warning: Basil essential oil is a powerful analgesic. In high doses, it can cause serious health problems and drowsiness. It should not be used undiluted on the skin or in a diffuser. 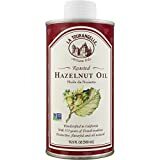 Miracle Botanicals Organic Hazelnut Oil - 100% Pure Therapeutic Grade Corylus Avellana Carrier Oil - 4oz.